He begins by asserting, falsely, that bitcoin is the worst performing currency in the world. He then links to an article that indicates that bitcoin lost more than half its value in 2014, entering the year at about $775 and ending at about $325. That article makes no claim that bitcoin was the worst in the world, only mentioning bitcoin’s value in comparison to oil and the Russian ruble. He also links to a hit piece on Slate which claims only that the Russian ruble hasn’t fallen, recently, as much as bitcoin did in 2014. Of course, O’Brien is not interested in the loss of value of the dollar since the Federal Reserve was created about a hundred years ago. 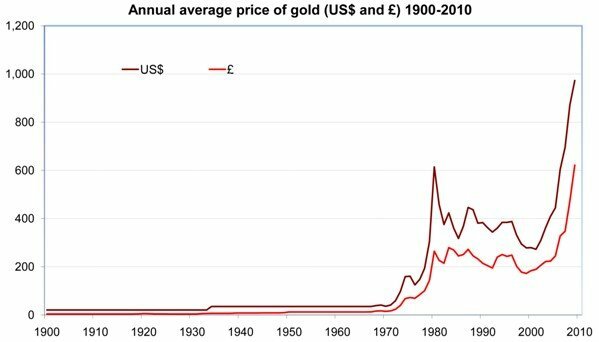 By simply looking at the price of gold at that time, $21 per ounce troy, and the price today, $1,261 we can see that the dollar has lost 98% of its value. A great many central banks have been responsible for hyperinflation, periods when their currencies lost essentially all their value. One of the worst in the world was the Zimbabwe dollar which lost 98% of its value every day, on average, for the month of November 2008. Great work, central bankers. If you are interested in the actual facts about poor-performing currencies, you might check wikipedia. Obviously, O’Brien could not be bothered. To say that bitcoin’s price did poorly in 2014 is certainly true, but it did extremely well in 2010, 2011, 2012, and 2013. It has had more good years than bad. Its current value is much higher than its value in 2010, so if you bought bitcoin then and held it you would be doing much better than if you had bought any of the major stock exchange index funds at the same time and held them. Then O’Brien asserts that bitcoin isn’t a currency. He’s completely wrong. Not only is it a currency, a current money circulating as a medium of exchange, bitcoin is a good money. What is a Good Money? How Does Bitcoin Fit? A good money has six major features, according to analysts from Aristotle to Doug Casey. 1. It is divisible. Bitcoin, and all digital currencies, are infinitely divisible in that any asset represented in digital form may be subdivided into claims against part of that asset indefinitely. Gold and silver were long used as good money because they could easily be divided into very tiny units of weight. A painting by Picasso, however, loses a great deal of value when it is chopped up into tiny bits, so it would not be divisible. 2. Good money is convenient. For example, iron wheels used to be used in ancient China. Weighing dozens to hundreds of pounds, these units of iron were not convenient to move around. Camels have been used as currency in many nomadic cultures in Africa, but can be very unpleasant should you attempt to store them in a shoebox in the attic – either deteriorating rapidly in value or making demands for food and water that become … messy. Bitcoin is extremely convenient so long as it is possible to connect to the worldwide communications networks. Given that the worldwide communications net, or Internet, was designed to be robust enough to provide communications after a nuclear war, the odds are very good that bitcoin will serve you well. 3. Good money is consistent. Land and artworks make poor assets for use as money because they are not interchangeable. An acre of land is not equal to another acre of land in a different location, because the locations make a huge difference in value. Different individuals value different works of art at different values. Even gold and silver have global markets and may change their values in the context of a given national currency unit by many hundreds of dollars in a decade. It is therefore useful to have bitcoin that is consistently available. While bitcoin’s price value has been very volatile since it’s inception, that is a problem that will resolve itself over time. The more widespread Bitcoin’s acceptance grows, the more likely it is to stabilize. 4. Good money is durable. Gold and silver are very durable. Bitcoin can also be very durable if one uses data security techniques, off-site backups, and a robust information distribution technology. Happily, the global communications networks have been designed to survive a nuclear war, so there is good reason to think they can be durable. Salt would be an example of a traditional form of money that isn’t durable, since it doesn’t do well after getting wet. 5. Good money is valuable in other contexts. Gold and silver are especially useful for their electrical and metallic properties, including their ductility, malleability, and ornamental properties. Bitcoin can be used in nearly any context imaginable. Also, the bitcoin blockchain, which is necessary for the currency to function, but is not the same as the currency, has incredible value. The computing power of the bitcoin network, and transaction recording / processing on the blockchain, make it useful for everything from basic accounting to eliminating counterfeiting to even sending encrypted messages. 6. Good money is acceptable in many places and by many vendors. One of the most important features of money as a medium of exchange is whether it is acceptable. If nobody accepts your money, then it isn’t very useful. If the asset you value is not accepted in exchange for anything else, then it isn’t very valuable in a market context. Happily, digital currencies can be exchanged for each other, and are accepted by many vendors worldwide. Bitcoin is currently accepted in more countries than any other currency in the world, including some countries that are not recognized, yet, by the United Nations. In his essay, O’Brien asserts that bitcoin is a “Ponzi scheme for redistributing wealth from one libertarian to another.” Of course, he doesn’t define a Ponzi scheme. Here’s a brief definition, again from wikipedia. 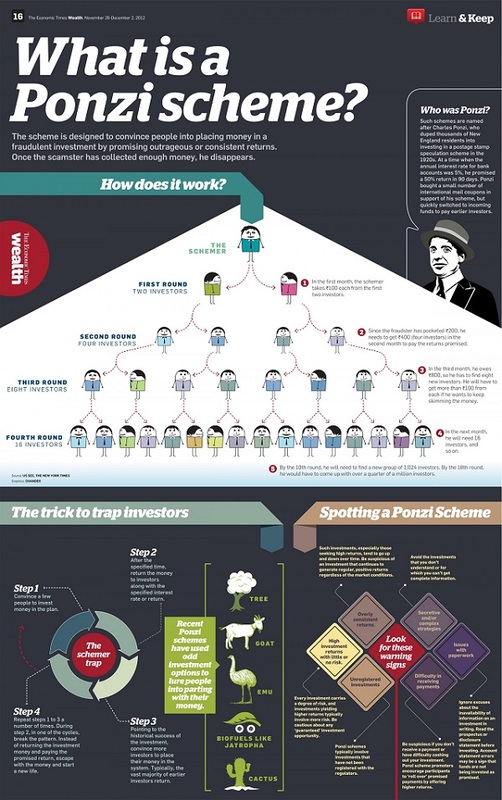 “A Ponzi scheme is a fraudulent investment operation where the operator, an individual or organization, pays returns to its investors from new capital paid to the operators by new investors, rather than from profit earned by the operator.” To get a better understanding of how a Ponzi scheme actually works, take a look at this infographic from The Economic Times, available on Visual.ly. In fact, Bitcoin is not any sort of investment scheme. Rather, it is a decentralised currency system which requires proof-of-work in order to mint new bitcoins. Rather than paying bitcoin miners with “new capital” from “new investors,” Bitcoin is an algorithm that creates new bitcoins for those capable of solving hash functions. Mind you, Matt O’Brien may never have seen a hash function, or any complex mathematical algorithm, so he might be a bit fuzzy on how Bitcoin works. O’Brien worries about consolation to anyone who bought Bitcoin “anywhere near Bitcoin’s $1,100 top.” Well, of course, the 4 December 2013 high was $1,147.25, more than 4% higher than O’Brien claims. Even the simple facts he doesn’t get straight…but that is beside the point. Bitcoin cannot be a Ponzi Scheme, pyramid scheme, etc., as there is no person at the top that is defrauding those who have converted other currencies into bitcoin. The closest thing to that would be Satoshi Nakamoto, the creator of bitcoin. However, considering the fact that the bitcoins mined by Satoshi early in bitcoin’s life are in wallets that have remained dormant this entire time, he does not seem to be profiting at all. He did not convert any of his coins to a fiat currency, nor has he used them to make any purchases. They have not been touched at all. Then O’Brien makes a really hilarious statement. “It’s too bad Bitcoin doesn’t have a central bank to help stabilize its value.” Really? Tell that to the people who suffered the 1946 hyperinflation of Hungary, the 2008 hyperinflation of Zimbabwe, the 1994 hyperinflation of Yugoslavia, the 1994 hyperinflation of Republika Srpska (part of Bosnia-Herzegovina), the 1923 hyperinflation of Germany, the 1944 hyperinflation of Greece, or the similar life-crushing hyperinflationary episodes in Angola, Argentina, Armenia, Austria, Azerbaijan, Belarus, Bolivia, Bosnia, Brazil, Bulgaria, Chile, China, Estonia, France, Georgia, Kazakhstan, Kyrgyzstan, North Korea, Nicaragua, Peru, Philippines, Poland, the Soviet Union, Taiwan, Tajikistan, Turkmenistan, Ukraine, Uzbekistan, or Zaire. O’Brien, no doubt, likes central banks because they fund big government. And, presumably, he likes big government funding because lots of wars are only possible with the money that governments get from the tricks of central banking. So, what he is really saying is, it is too bad Bitcoin isn’t being used to fund the military industrial complex that Eisenhower warned was exerting unwarranted influence, and it is really too bad that more people aren’t being sent overseas to slaughter people in other countries. Really, it is so awful that Bitcoin is only being used by people who consent to accept it. Sure, the value of a bitcoin could drop significantly. In fact, it it quite likely that bitcoin will continue to experience rises in price, followed by declines, until it reaches critical mass. However, it cannot truly fail, unless the internet itself fails. Bitcoin has, according to O’Brien “no inherent value,” which is certainly an interesting claim. Perhaps he thinks that the USA dollar is still tied to gold, or has some inherent value. It does not, of course. The USA dollar, the EU euro, the Great Britain pound, these are all pieces of paper or digital entries in a computer system – they are not tied to anything with inherent value. President Nixon did away with the last vestiges of the gold standard all the way back in 1971. But, bitcoin does represent inherent value. Each bitcoin added to the blockchain represents proof of work, proof of a hash function being applied to the public ledger transactions of the bitcoin currency. Gigabytes of data are involved in the blockchain. The processing power of the bitcoin network is more powerful than every supercomputer in the world combined. In fact, thanks to the advancement of SHA-256 ASICs, when it comes to solving blocks on the Bitcoin network, and processing the transactions, it is quite likely that even if every computer in the world were to be joined together, and started mining bitcoins, they still would not equal the power of the current network. Bitcoin was overvalued for a period. It had been following a steady rate of increase, and then the explosion upward in early 2013 was fueled by speculation, manipulation, and a huge influx of capital. However, Bitcoin may now be returning to a normal valuation, which could lead to lower volatility, and a slow steady rise. O’Brien asserts, falsely, and in the most defamatory way possible, that “almost nobody uses it to buy anything other than drugs.” While Bitcoin is accepted at some mainstream pharmacy sites, its clearly being used by at least hundreds of thousands, and probably millions of individuals to make all kinds of purchases, from coffee to textbooks to wages. O’Brien has absolutely no proof that “nobody uses it to buy anything other than drugs,” so he doesn’t bother to offer any. Unfortunately, we cannot provide proof of what, exactly, people are using their bitcoins to buy. However, as Microsoft, Overstock, Expedia, Tiger Direct, Newegg, Dish, Okcupid, Shopify, and a plethora of other companies accept Bitcoin for payment, it is pretty easy to guess. People use bitcoins to buy whatever they like. When you add Gyft on top of this, which allows users to use bitcoins to purchase gift cards that are usable at places where Bitcoin is not accepted, it truly is hard to find many things that the average person needs that they could not purchase using BTC. Then there is the fact that Bitpay reported processing over $1 million in BTC payments per day in 2014. Considering Bitpay is only one Bitcoin payment processor, and does not offer it’s services to companies selling illegal drugs, that seems to contradict O’Brien statement on it’s own. Part of what he describes as the Bitcoin currency is correct. “Bitcoin, remember, is a digital ‘currency’ that lets you send money online without needing a bank to confirm it. That’s because it substitutes a decentralized network of middlemen for a single middleman.” No doubt, O’Brien thinks that just one big bank would be better than thousands, or hundreds of thousands, of small ones. Which is strange, because in their 2011 annual report, the Dallas Federal Reserve lamented that by 2010 thousands of American banks had gone out of business, and over half of all financial assets in the country were controlled by just five giant banking conglomerates – which had to be bailed out in 2008-09 because they were “too big to fail.” Decentralization seems like a blessing, in comparison. But then O’Brien goes awry, again. He claims, “And instead of paying them fees, it pays them with new Bitcoins.” But that isn’t so. No, the Bitcoin protocol couldn’t have gotten going without paying Bitcoin miners in new bitcoins because there were very few transactions on which to collect fees. But, today, there are over 80,000 transactions a day in many cases, and up to 105,000 on a recent day. Each transaction has a tiny fee associated with it. Over time, the number of new bitcoins created with every block added to the chain will diminish, and eventually stop. 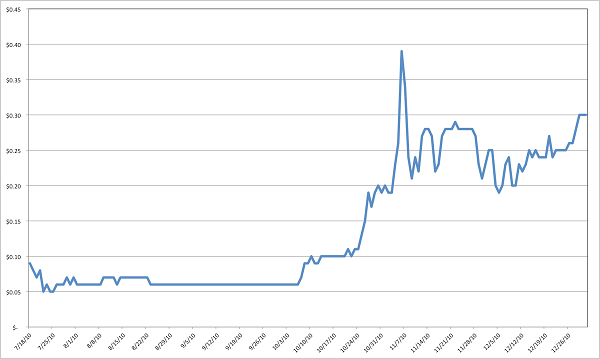 So far, over time, the number of bitcoin transactions has continued to rise, and is rising still. Soon, we’ll see a cross-over, and more money will be provided to Bitcoin miners, and others, from transaction fees than is provided in new Bitcoin. But, such nuances aren’t consistent with O’Brien’s desire to kick Bitcoin while it is down from its 2013 high, and keep kicking it, whether the things he says are true, or not. Irreversible Bitcoin Transactions Are Bad? The array of silly things he’s willing to say seems nearly endless, but we are coming toward the end. He says that because of the way Bitcoin’s decentralised public ledger works, bitcoin transactions are irreversible, and, therefore, appealing to criminal hackers. He does not point out that bank wire transfers after 24 hours are irreversible, unless you have time and money to get a court order, by which time the funds are certainly gone. Nor does he seem to care that a huge number of merchants have accepted credit card funds, provided goods or services, and seen those funds removed by criminal scammers who falsely claim that they didn’t get what they paid for. Sure, he’s worried that consumers might have no recourse, but if merchants get screwed, that’s a cost of doing business, right? Or, it was, before Bitcoin. Strangely, O’Brien seems to think that the latest supercomputers are being used to solve Bitcoin hash functions. He seems to have missed out on the networks of application-specific integrated circuits, also known as ASICs, being deployed for Bitcoin mining instead. So, he kind of looks foolish. In several places, he asserts that all bitcoin miners have borrowed heavily to finance their expansion without showing evidence for this claim. It is certainly possible to use equipment, even application-specific equipment, as collateral for borrowing. But the finances of many bitcoin miners aren’t a matter of public record, as they are not publicly traded companies. He points to one mining group going into default, but he makes no effort to evaluate the profits of other bitcoin miners. Then he makes the claim, “But in the long run, we’re all dead, and Bitcoin might be too.” There’s certainly no empirical evidence for my death…yet. And Bitcoin, today, is worth 541% more than it was at the end of 2010. Very few currencies can say that, and even fewer “investments.” Bitcoin is far from dead, and there is nothing to suggest that it is headed in that direction.